Mahtob had a normal life in Michigan until her Iranian father suddenly transformed into an intolerable and abusive husband, kidnapping five-year old Mahtob and her mother into Iran, where they were mistreated in the midst of an already difficult time of war. 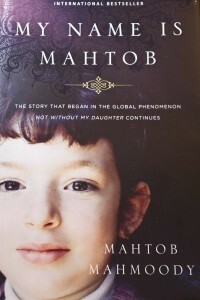 Upon their escape, Mahtob’s mother wrote Not Without My Daughter, which was also made into a movie. Now Mahtob shares her memories of that part of her life, as well as her aftermath in living with the active threat of her father, struggling through Lupus, and learning to forgive. Framed within the motif of No-ruz (the Persian New Year), Mahtob’s writing is elegant, honest, bold, and vulnerable. The details Mahtob shares from her childhood kidnapping are vibrant and touching. The emotional pain and fear she dealt with after those events in trying to make a normal life for herself are equally captivating, and written with the suspense of the moment. I thoroughly enjoyed reading Mahtob’s memoir. It is an inspirational story that could help others overcome the traumas and unforgiveness in their own lives.